Verse 18 – God deigns to argue the case with us, that all may see the just, nay, loving principle of His dealings with men (Isaiah 43:26). scarlet — the color of Jesus Christ‘s robe when bearing our “sins” (Matthew 27:28). So Rahab‘s thread (Joshua 2:18; compare Leviticus 14:4). The rabbins say that when the lot used to be taken, a scarlet fillet was bound on the scapegoat‘s head, and after the high priest had confessed his and the people‘s sins over it, the fillet became white: the miracle ceased, according to them, forty years before the destruction of Jerusalem, that is, exactly when Jesus Christ was crucified; a remarkable admission of adversaries. Hebrew for “scarlet” radically means double-dyed; so the deep-fixed permanency of sin in the heart, which no mere tears can wash away. snow — (Psalm 51:7). Repentance is presupposed, before sin can be made white as snow (Isaiah 1:19, Isaiah 1:20); it too is God‘s gift (Jeremiah 31:18, end; Lamentations 5:21; Acts 5:31). 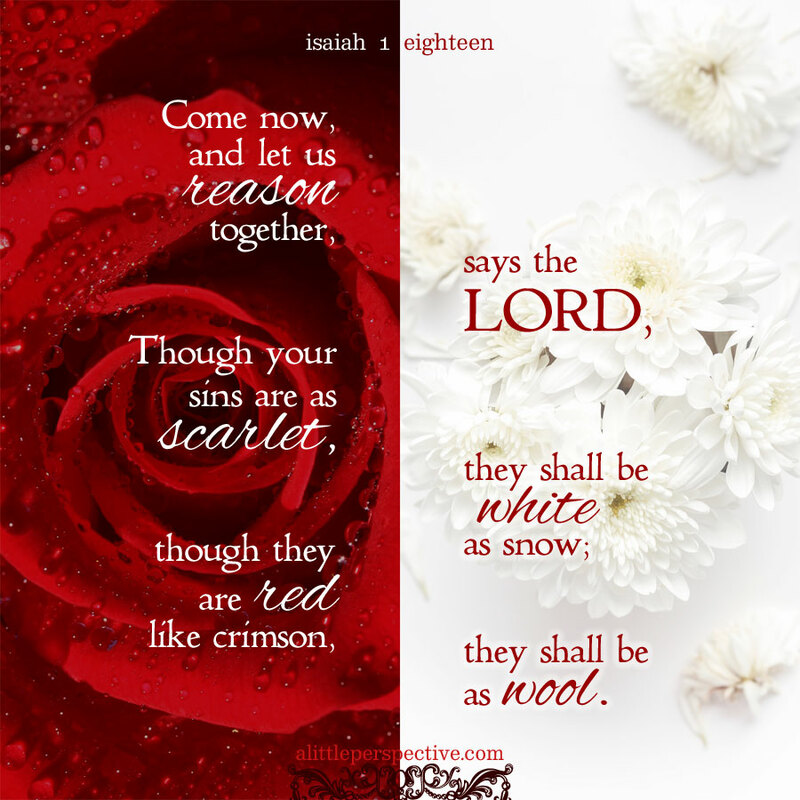 red — refers to “blood” (Isaiah 1:15). as wool — restored to its original undyed whiteness. This verse shows that the old fathers did not look only for transitory promises (Article VII, Book of Common Prayer). For sins of ignorance, and such like, alone had trespass offerings appointed for them; greater guilt therefore needed a greater sacrifice, for, “without shedding of blood there was no remission”; but none such was appointed, and yet forgiveness was promised and expected; therefore spiritual Jews must have looked for the One Mediator of both Old Testament and New Testament, though dimly understood. Verses 16-20 – Not only feel sorrow for the sin committed, but break off the practice. We must be doing, not stand idle. We must be doing the good the Lord our God requires. It is plain that the sacrifices of the law could not atone, even for outward national crimes. But, blessed be God, there is a Fountain opened, in which sinners of every age and rank may be cleansed. Though our sins have been as scarlet and crimson, a deep dye, a double dye, first in the wool of original corruption, and afterwards in the many threads of actual transgression; though we have often dipped into sin, by many backslidings; yet pardoning mercy will take out the stain, Psalm 51:7. They should have all the happiness and comfort they could desire. Life and death, good and evil, are set before us. O Lord, incline all of us to live to thy glory.